Police in El Salvador say the country has gone 24 hours without any murders, a rare occurrence in a nation plagued by gang warfare. The country has one of the highest murder rates in the world according to the United Nations. Ten people a day had been murdered so far this year in El Salvador until the unexpectedly peaceful Wednesday. Most of the violence is caused by criminal gangs, known locally as maras, which operate across Central America. The police did not offer any explanation for the lack of violence. But the authorities were quick to deny that they had restored a controversial truce with the gangs. The criminal groups were formed initially in the streets of Los Angeles in the 1980s by children of Salvadoran migrants escaping the country's brutal civil war. When the war ended in 1992 and many of them returned home, they took the LA gang culture with them. The maras or pandillas are involved in drug trafficking, robbery and extortion. 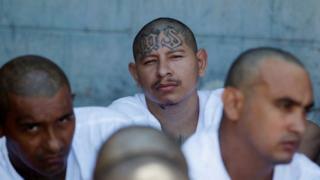 The two main street gangs active in the region are Mara Salvatrucha, or MS-13, and Mara-18, or 18th Street Gang.